The GPIO contacts of the Raspberry are not labelled. But you can find reference cards on many Raspberry Pi Shops. They are put over the GPIO connector pins. Of course, these reference cards do not have to be made of a hard material. They can easily made of paper with some manual work. They are printed out and then cut to size. The holes can be made with a nail. Such PDF templates are often found on the internet, for example at http://noxmiles.de/Raspberry-Pi-GPIO-Beschriftung.pdf. A special option is the project Pi Leaf https://www.raspberrypi.org/blog/raspberry-leaf. The drawing was not done in a graphics program. It is defined by a description language. Originally the project was described on Dr. Monk’s DIY Electronics Blog and published on Sourceforge . For the outdated project, a fork was created by “Sanderr” on Sourceforge. This version also includes a template for the 40-pin connector of the current Raspberry Pi variants. The description file “pi-leaf.asy” can be used to create the PDF file with the program Asymptote. An already created PDF template file can be downloaded from our homepage at http://raspjamming.at/PDF/pi-leaf.pdf. 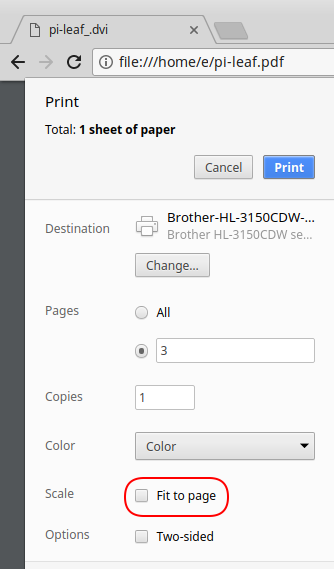 When printing (e.g. with the browser Chrome), the setting “Fit to page” must be deactivated! Programmer und Raspberry Pi enthusiasts.